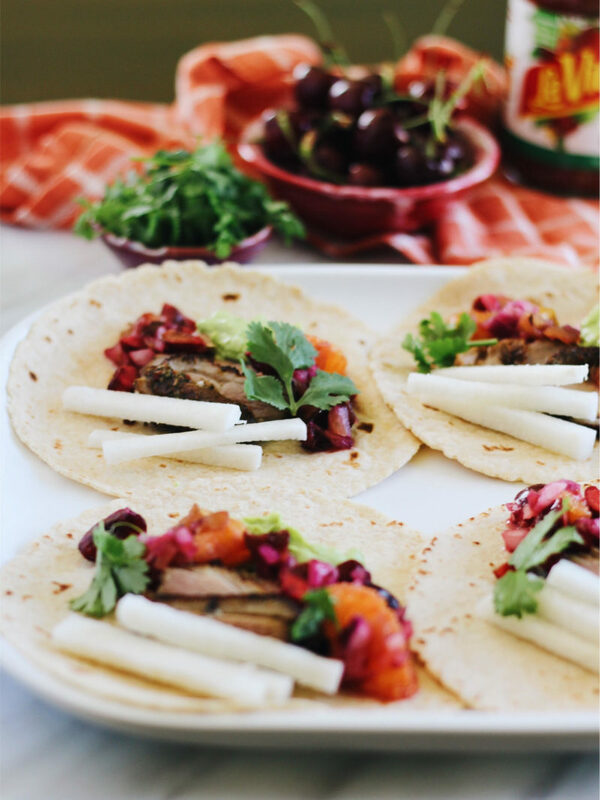 Duck confit tacos with a fresh cherry-orange salsa is the perfect summer meal! Whether you buy duck confit or make your own, this is a great dinner party recipe to impress your guests. 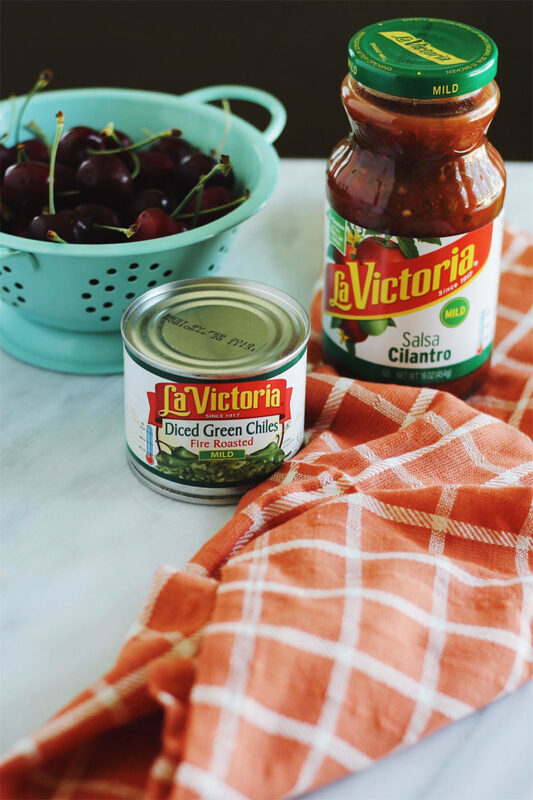 This post is made in collaboration with LA VICTORIA® BRAND to celebrate #100YearsofLaVictoria! I thought I had tried every kind of taco there is. Carnitas, cactus, even beef tongue. That was until I partnered with LA VICTORIA® Brand to bring you these duck confit tacos. Duck confit tacos? Nope, never had those. But I need to change that ASAP! I’m a big fan of LA VICTORIA® Brand salsas, sauces, hot sauce, and chiles. I’ve collaborated with them before to bring you Grilled Fish Tostadas with Cilantro-Lime Crema. These duck confit tacos are inspired by a very fun occasion. To celebrate La Victoria’s 100th birthday, the brand is hosting four events in San Diego, LA, San Francisco, and Portland. Each event will be a combination of food, music, and art. (The best things in life, am I right?) The events are supporting local artists and giving them a chance to win a very generous monetary prize. The event in San Francisco was a hit, featuring these exact duck confit tacos from chef Gustavo Romero. It was created in celebration of the bold Mexican-inspired flavors of the West Coast (which I know all about from living in San Diego five years). For these duck confit tacos, you can either buy duck confit or make it. Now, like a crazy person, I decided to make my own in 98 degree weather. I can strongly confirm to you: that was a bad idea. 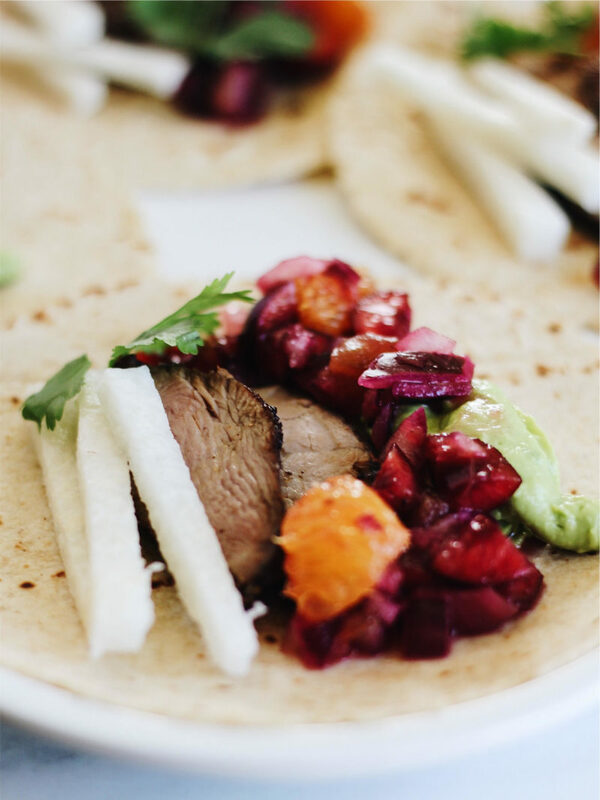 Then, fill either a jicama taco (used in the recipe) or a tortilla (what I used, cause #carbs) with the duck, LA VICTORIA® Cilantro Salsa Mild, a cherry-orange salsa made with LA VICTORIA® Fire Roasted Chiles, and avocado mousse. The salsa, made with fresh cherries, orange segments, chiles, red onion, and lime juice, is amazing. That really takes these duck confit tacos to a whole new level and screams summer! I also love the Mexican marinade, which I am now using on everything. Forever. Ready to try some delicious duck confit tacos?! 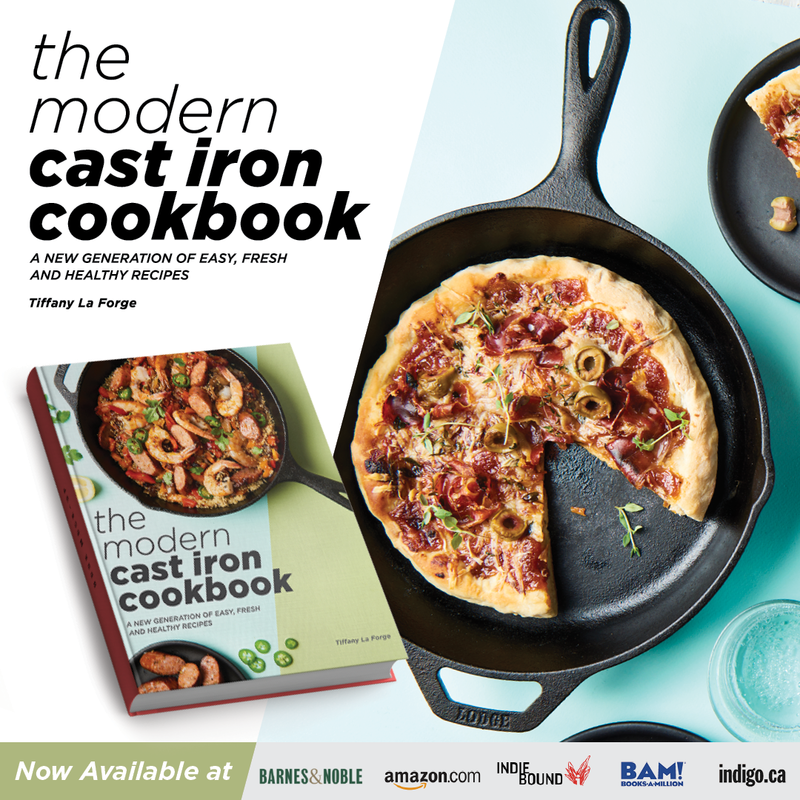 Grab the recipe here, and also check out LA VICTORIA® Brand’s next dinner event happening in Portland, OR on July 13th! Savory, rich duck confit is paired with a fresh cherry-orange salsa for a decadent, delicious, and different taco. 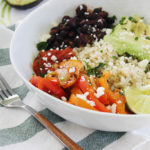 Make the salsa: Combine all of the ingredients in a bowl and set aside in the refrigerator until ready to serve. Make the marinade: Combine all of the ingredients in a mason jar and shake vigorously until combined. Make the avocado mousse: Mix all of the ingredients in a food processor until creamy and smooth. Set aside in the fridge until ready to serve. Make the tacos: In a hot pan, heat up the prepared duck confit until hot. Add some of the marinade. 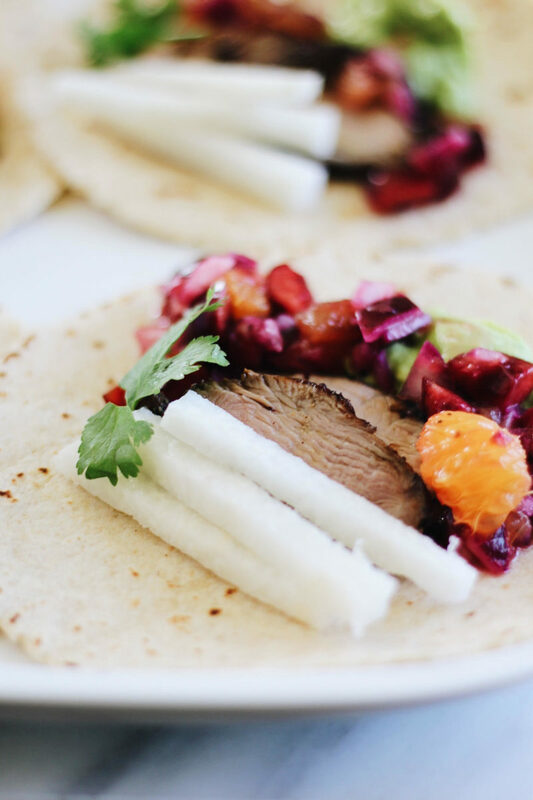 Place the duck confit in warm tortillas and top with the salsa, avocado mousse, and sliced jicama. Drizzle with a little more marinade. Top with fresh cilantro. Enjoy! Leftover marinade makes a great salad dressing to a simple side salad. 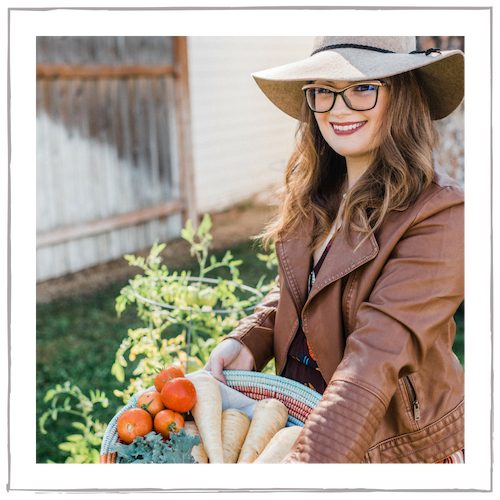 This post contains affiliate links but are always products I highly recommend & use myself! 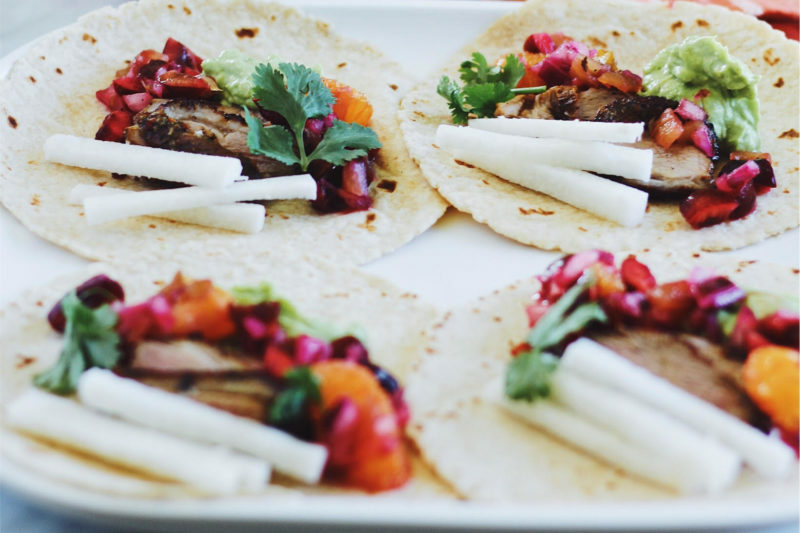 Thank you to LA VICTORIA® Brand for this delicious Duck Confit Tacos recipe! Will you be joining us at the Portland event on July 13th? What are your favorite kind of tacos? Let me know in the comments below! When I told my friends I was having this, they got so mad and jealous hahaha. What a great meal, and I love that crunch from the jicama. The flavor profile here is just really welcoming and tasty – leaves you wanting more though, which isn’t a bad thing haha. So delicious! I have never tried duck meat in tacos before but the outcome looked so good! Something I will have to try out for myself and the family. Thanks for the great tip! I have to say that like you, I’d thought I’d tried all tacos as well. Nope, never heard of these! However, they look absolutely amazing! Wow this looks really good! I’m always looking for some new salsa recipes to try! Love it! I make tacos all the time, and I’ve never even thought about using duck in them. 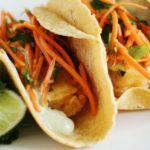 Thanks for the idea – these will be a hit on Taco Tuesday at my house! duck meat is delicious, and eat with tacos??? it’s should be try. oh, my goodness! That’s looks really appetizing and I love those colors. I would love to try. Thanks for sharing! I have never had ducks before but I love tacos. Maybe this won’t be so bad! I love Salsa but have not tried this brand. I will look for it the next time I am shopping. Sounds really good. Oh my gosh! This looks incredible! 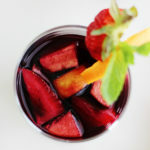 I’ve been craving cherries my entire pregnancy and this is such an incredible way to use some! Yum! That sounds delicious! Believe it or not I have never eaten duck but it looks like I need to try it. This looks so good. 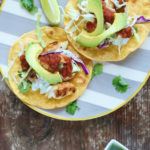 I’ve not had tacos in ages and this post just makes me want to have some asap and I think your recipe is going to be first test! 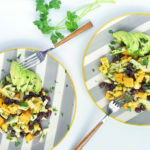 I have not had tacos in ages and this really makes me want some – how good do yours look I need to try this recipe out! 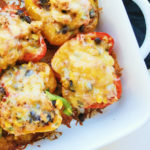 These look amazing and the salsa would be so incredibly good with the duck! I haven’t tasted a duck meat. Does it taste like chicken? Am curious! This is a fun twist for tacos! I would have never thought to put duck on them. Yum! I never would have thought about putting duck in tacos. 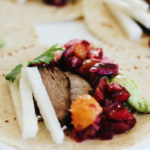 The cherry orange salsa sounds like it would go perfectly with the duck! This sounds (and looks) so fancy! Duck is probably my favourite meat in the world and I can’t believe I’ve never tried it in tacos before! This sounds so fancy! Duck is one of my favourite meats and I actually can’t believe I’ve never tried it in tacos!